The Eucharist (lit. 'Thanksgiving') is the central way we, as Christians, come together to worship God. It is the occasion when we re-enact the last meal that Jesus shared with his disciples and friends before his Crucifixion, when he shared bread and wine with them and asked them to continue to do this in remembrance of him. The Eucharist is one of the two dominical sacraments of the Church. That is, it is one of the two sacraments that Jesus explicitly asked his followers to continue (the other being Baptism). The offerings of the people being collected at the Eucharist. A sacrament is a visible and outward sign of God's inward and spiritual grace, working in our lives, which effects that which it signifies. So Christians believe that coming together to celebrate the Eucharist and to receive Jesus into our lives makes a tangible difference to us. The Eucharist is given many different names in the Christian tradition, from Eucharist, Mass and Holy Communion to The Last Supper. Each name emphasises a different important aspect of the Eucharist. The word 'eucharist' comes from the Greek and emphasises the importance of giving thanks to God for all that we have received in life. The word 'mass' comes from the final words of the service in Latin 'Ite, missa est' (lit. 'go, it is sent'), it emphasises that the most important things Christians do in a service is to walk back out of the door to share their Faith and good works with the wider world. The word 'communion' emphasises that we are not individuals before God, but part of a community in relationship with each other. This emphasises how as a community we can come to more fully understand God who is one God, yet also a community of three Persons, Father, Son and Holy Spirit in perfect relationship with each other. The title 'the last supper', quite evidently, emphasises the shared meal aspect of the eucharistic service. Worship tends to be formal, the priest wearing Eucharistic vestments and being assisted by at least one robed server. Readings follow the Revised Common Lectionary and are usually taken from the NRSV translation of the bible. Hymns tend to be accompanied by organ. For major feasts of the Church incense is sometimes utilised in the services. 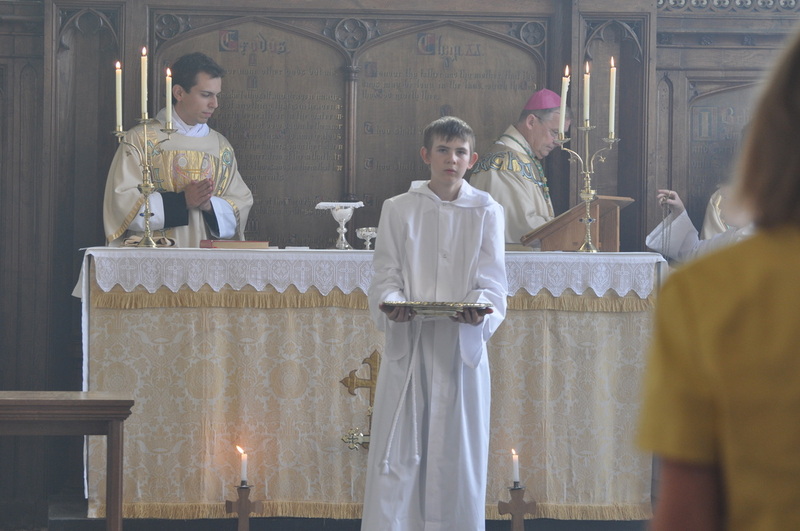 We encourage the participation of children in the Eucharist, principally through serving, but also have regular all-age Eucharistic which have a more informal atmosphere.